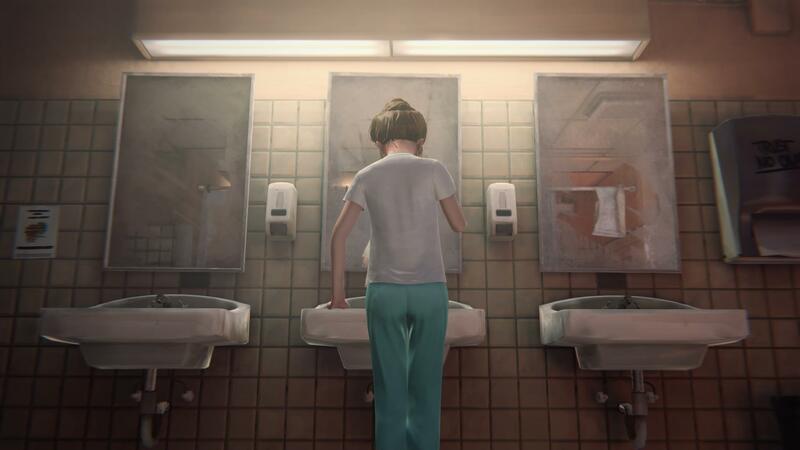 Warning: Major spoilers for Life is Strange: Episode 2 and Episode 4 ahead. Life is Strange is a game about do-overs. If you don’t like the immediate outcome of a dialogue option or story choice, you can just rewind and give yourself a second chance. Or third. Or fourth. And so on. Throughout the first episode and through most of the second the player has yet to experience any real limits on Max’s time rewind power, and they easily get used to this. That all ends with Kate Marsh. Throughout the first episode Kate acts strangely, becoming more withdrawn than she already was, having weird run-ins with campus security and crying alone in her room. She only gets worse throughout the second episode, where the player learns that the source of Kate’s depression is a very recent sexual assault. Max is given the chance to comfort Kate and give her advice on what to do next. Regardless of the choice made here, at the end of the episode Kate still ends up on the roof, ready to jump, and it’s Max’s job to talk her down. And in a game where the player character has the power to rewind time and do things over until they turn out to their liking, that should be no problem right? If you don’t pick the right dialogue options the first time you can just try again like in every other part of the game up until this point. Except not. Throughout Episode 2 Max has been having increasing problems with her powers, and this, like Kate’s story, all culminates at the climax, where Max temporarily loses her ability to control time. You only have one shot at this dialogue, and if you fail Kate’s gone for good. The first time I played, I lost. I messed up when it came time to remind her which family member would be most devastated by Kate’s suicide, and she jumped. And I miiiight have cried just a little. Because why wouldn’t I? Not only did I go out of my way to help Kate at every opportunity I could and made sure that I always picked the kindest and most supportive dialogue options when it came to comforting her, but none of that really mattered. Because she jumped anyway. This is such a hard-hitting scene for a combination of reasons. Firstly, as I have mentioned before, the player suddenly loses their do-over ability for the first time in the game so far. After giving us nearly two episodes to get used to the idea that we can take as many chances as we like to get something right, the game rips that away from us when it matters the most. Secondly, the game auto-saves. The game doesn’t tell you when it’s doing so and being on the roof with Kate is the last scene before the cutscene that ends the episode, making save scumming hard if you don’t know what you’re doing. And lastly, everything here is in the hands of the player. Kate may die, or she may not, depending on the player’s choices earlier in the game and how well they remember they saw when they were allowed into Kate’s room at the beginning of the episode. This isn’t like the end of episode 4, where Chloe gets shot regardless of anything you’ve done in the game leading up to that point. Kate killing herself isn’t a necessary part of the story, it feels like a personal failure on the player’s part. And the multiple shrines to her that you see around campus from Episode 3 onwards are there to remind you of that. I just adore how Dontnod handled everything about Kate’s arc. From everything leading up to her suicide attempt, to the attempt itself, to its aftermath, whether she succeeded or not. Even the objective failure state of Kate jumping is handled well, making the player feel helpless and guilty, much like one would in real life if they found themselves in the same situation. The permanent reminders of Kate’s death that linger around the Blackwell campus for the next episodes just to hammer the point home. I really felt like I lost a friend when Kate jumped, and I felt some of the same grief and guilt that I would had the same thing happened to me in real life. And the way Dontnod made this happen was absolutely masterful. I can’t wait to be reduced to a sobbing mess once again when the final episode is released.